How many of you dream of owning a luxury yacht and having the freedom to sail the high seas? That’s right, almost everybody. Now you can cruise on the “Serenity” yacht. In case owning your own yacht isn’t within your budget, no worries. The next best thing is to book a yacht charter. Yachts can be chartered all over the world. From the Pacific to the Atlantic. The Gulf of Mexico to the Caribbean. The Mediterranean to the Indian Ocean. They are all perfect, luxury travel destinations. 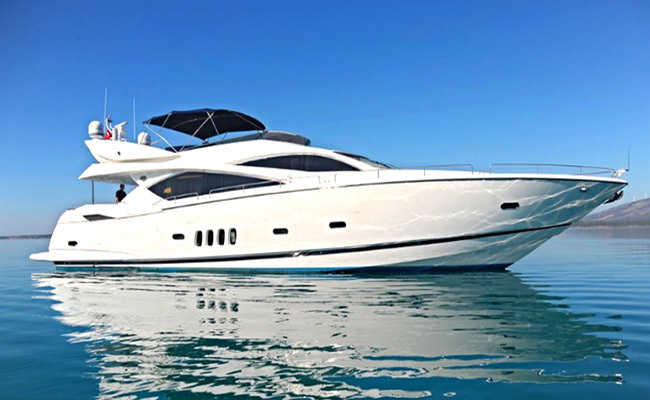 Serenity yacht is a superb, highly popular Sunseeker 82 vessel. It is fully available for charters in magnificant Turkey. Serenty is based in Didim Marina North of Bodrum. As a result, this location offers the perfect opportunity to cruise the very best locations in Southern Turkey. Has Turkey been on your bucket list? Well it’s time to check it off and schedule a luxury charter cruise. The culture and natural beauty of this amazing country await. So what are you waiting for? We want to share some of the key specifications of Serenity yacht. The Life of Luxury offers a wide variety of luxury travel services. Therefore, we have great pricing to the best travel destinations in the world. In addition, we can provide VIP access to the red carpet events around the globe. Plus, fashion shows, private parties, movie premiers and even celebrity meet & greets. Is it time to book a charter cruise on Serenity yacht? Contact us today for more information. Follow our popular luxury blog for the latest luxury yacht news.